‘After eight days had passed, it was time to circumcise the child; and he was called Jesus, the name given by the angel before he was conceived in the womb’ (Luke 2:21; 1:31). Joseph and Mary know it hurts to be circumcised. At the right they watch the Child who is screaming as he is being held tightly by a dignitary who is helping the rabbi perform his distressing ceremonial duty of removing the baby boy’s foreskin. Jesus will become a full Jew when he is circumcised after the commandment that God gave to Abraham as a sign of his covenant with Israel: ‘Throughout your generations every male among you shall be circumcised when he is eight days old’ (Genesis 17:12a). Circumcision of the foreskin is painful, yet it is even more grievous when the circumcision of the heart fails to occur (Jeremiah 4:4) – the conversion that incorporates one into Christ and is the Christ-circumcision of the heart (Colossians 2:11), for whoever worships God in the Spirit is the truly circumcised (Philippians 3:3). The high priest with staff and bag surveys the proceedings from above. He has set fire to the incense which is a sign of the transitoriness of time and ascends as a sweet-smelling prayer to God’s face (Psalm 141:2), out of thankfulness for the mercy of detachment from what is all-too-human and temporary. He looks forward to the Eternal One who will leave time behind and will teach that the invisible is more valuable than the visible, the heavenly more valuable than all that is earthly (Colossians 3:2). 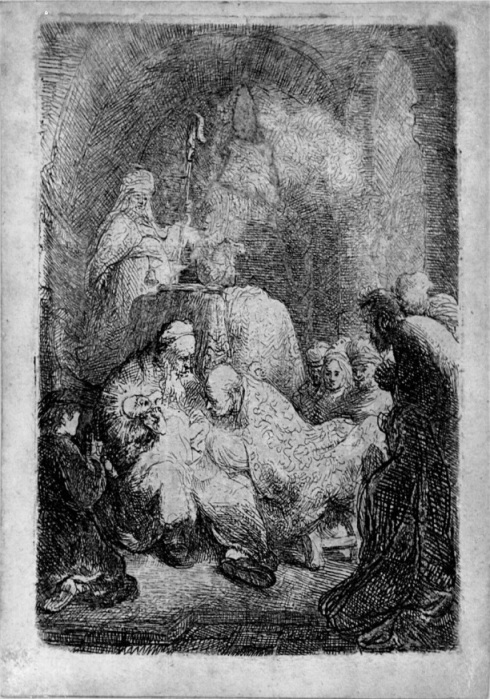 Rembrandt: Jesus’ Circumcision, 88 x 64 mm., etch, ca. 1630, Museum Het Rembrandthuis Amsterdam.